In Ireland, pest control companies regularly trap feral cats and kill them -- a practice that must be stopped immediately. All cats, no matter whether they're feral or someone's pets, should have the right to live without fear of being trapped by a stranger and potentially murdered for being in the wrong place at the wrong time. That's why Care2 member Maureen G. started a petition asking Ireland to ban the trapping and killing of feral cats. In Ireland, pest control or "wildlife management" companies frequently kidnap feral cats off the streets to kill them or release them in places where they're unfamiliar with the territory. They say this is necessary to "prevent the spread of disease," but in reality, science shows feral cat colonies pose no health risks to humans. Obviously, there are more effective, far less cruel ways to reduce feral cat populations than by indiscriminately killing them. Neutering or spaying the cats rather than slaughtering them outright, for example, would be a much better long-term solution to the issue -- and it wouldn't carry the risk of accidentally murdering someone's beloved pet. In Ireland, there is no legislation to protect feral cats and save them from suffering. 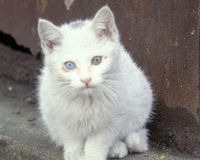 Please ask Ireland to ban the killing of feral cats!